Ever since it was revealed in January 2017, Square Enix's Project Octopath Traveler has held Switch owners' attention. The game combines 16-bit era sprites and textures with 3D environments to create a sort of high-definition retro aesthetic (or "HD-2D" as the developers have described it), which plays well with its old-fashioned, turn-based JRPG structure. It's also not too long - just slightly lengthier than a typical reveal trailer. In fact, it's just 33 seconds longer than Project Octopath's own trailer from the September 2017 Nintendo Direct. And throughout, you're seeing not just people talking about the game or mock-ups, but in-game footage and changes playing out in real-time, all backed by that lovely score. It's more understated, human, and intimate than many of today's bombastic and blockbuster-y videos, but I think that also helps it stand apart. Remember the old adage: show, don't tell. In an age of early access games being sold at near-to-full price, we're constantly being told that developers and publishers are listening to player feedback and adjusting their games accordingly. 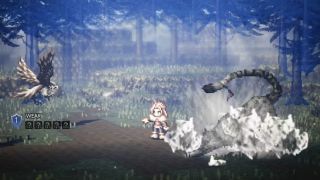 This Project Octopath video shows that, and other studios ought to take note.